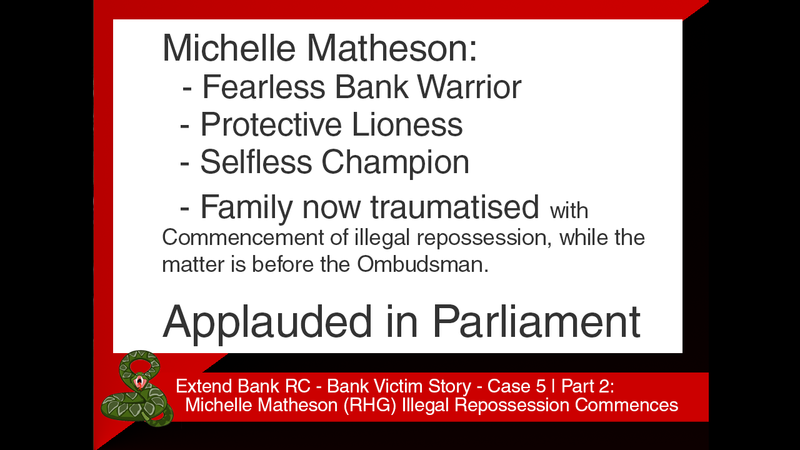 "I rise to talk about the banking royal commission and to highlight the efforts of one of my constituents, Michelle Matheson. Michelle lives about five minutes from my electorate office. It was good to see her in Canberra last week with many other victims of the banking and financial services sector. Michelle was here to share her story of years of pain and heartache and the devastating impact that bad financial advice and corporate malfeasance has had on her and her family. In the time allocated to me, I want to draw the attention of the House to the courage of Michelle and to how completely out of touch this rotten government is. When I met with Michelle recently, she explained to me how vital it is that the terms of the royal commission are widened and the duration lengthened. I want to thank her for her steely courage and determination in pursuing the outrageous practices of the lender she was fell victim to. Michelle is a single mother and works three jobs. The impact of the advice and the behaviour she was subjected to has shattered her world and that of her family, particularly her elderly mother. The banking royal commission would not have happened if it were not for Australians like Michelle pressuring the government to hold a full inquiry. Michelle has been to Canberra before. The current Prime Minister was even asked a question about her particular circumstances in question time. This was whilst he was still denying there was anything wrong with the banking and financial services sector, when he would say, almost on a daily basis, that there was nothing to see here and what a waste of money a royal commission would be. When he was asked about Michelle's circumstances, the current Prime Minister, for at least the next half-hour, arrogantly declared that a royal commission would be of no assistance to her or other victims. He sneeringly stated that all my party could offer her was a royal commission. I want to note briefly that the likely next Prime Minister, the member for Dickson, voted 22 times to block a royal commission into the banking and financial services sector. The day after the royal commission was announced, he told his mate Ray Hadley on 2GB how regrettable it was and that the commission should focus on industry superannuation funds, demonstrating an obsession held by many conservative ideologues. Conservatives like the member for Dickson wanted the commission to investigate well-performing, transparent industry super funds that work in the interests of their members, not fraudulent banks and financial institutions that have ruined the lives of tens of thousands of Australians. I'm very glad to report to the House that in the two weeks that the royal commission spent examining the superannuation system, they found almost practically nothing of note in the industry super funds. They found that the industry super funds performed incredibly well, much better than every other super fund in the country, that they always acted in the interests of their members and that they were very conscious of the impact of government policy on their members' interests. In contrast, we saw scandal after scandal around retail superannuation funds, whether it was AMP, where the AMP trustees admitted they couldn't act in the interests of their members because they didn't have control of the third-party contracts they had with other AMP vendors; the ridiculous IOOF revelations; or super fund after super fund in the retail sector gouging members' returns to zero through fees. The member for Dickson's ridiculous ideological attack on industry super funds backfired massively, and just confirmed that the industry super funds deliver great returns for their members, whereas—some retail funds are okay—most retail funds are full of shonks and are just obsessed with ripping off the super funds of people unlucky enough to be members of them. To be truthful, this new conservative saviour of the Liberals, the member for Dickson, didn't want a bar of the royal commission. Odd as it may seem, he was on a unity ticket with the current Prime Minister in trying to stop it. It doesn't matter who leads this rabble that masquerades as a government. The member for Dickson has the same form as the Prime Minister denying justice for victims of the banking and financial services sector. Indeed, voting to give the banks a $17 billion tax cut at the same time as cutting penalty rates. The member for Dickson may not live in a harbour side mansion, but he certainly is as out of touch with the realities of life for everyday Australians as the current Prime Minister. Let there be no mistake, this government was dragged kicking and screaming to establish the royal commission into their mates at the big end of town. The Liberals and Nationals have stated on the record that it is regrettable that a royal commission is occurring. It's only because of the courage of my constituent Michelle, and tens of thousands like her who have suffered, that the royal commission has occurred. I pay tribute to her today and wish her and her family, and all those brave victims fighting for justice, well." 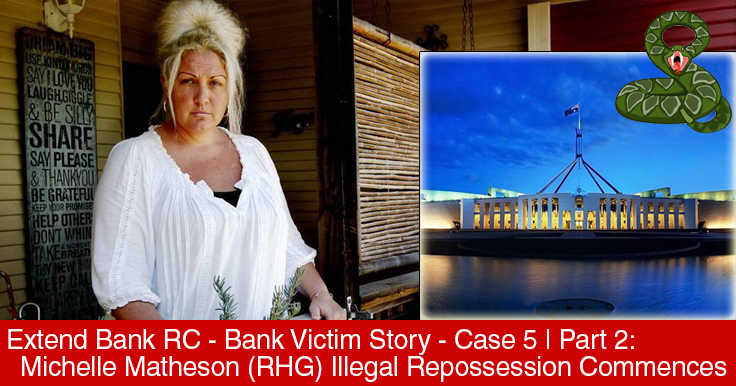 Please see Michelle's case in the Bank Victims Horror Stories series which is part of the extend the Banking Royal Commission campaign originating from the event in Parliament House, Canberra 14th Aug 2018. The video playing here is of Michelle's story being shared in Parliament by her local MP Pat Conroy (see transcript in Q&A Tab). "I attended Parliament House on 14th August for the extension of the Royal Commission Meeting of bank victims and was a speaker at the gathering in the Federation Chambers. Federal Member Pat Conroy raises my case in Parliament 31st August and highlights the struggle my family has endured at the hands of the bank, RHG Mortgage Corporation over the last 11 years. I receive notice on the 6th September the Credit and Investments Ombudsman (CIO) have closed my dispute without due process or investigation, I have had zero contact from them in 2 years. IE: No contact at all over the last 2 year period whilst awaiting dispute outcome. I lodged a financial hardship dispute with the CIO stating hardship due to mortgage fraud and requesting a legal contract at 2:35 pm on 6th September. The reference number of lodgement emailed to me from CIO and copy held. I contact the CIO at 4:09 pm 20th September moments after the receiver has served papers and left my home.....the CIO claim to have NO RECORD OF DISPUTE LODGEMENT ON THE 6TH IN SPITE OF THEIR SYSTEM SENDING ME CONFIRMATION OF LODGEMENT AND A REFERENCE NUMBER STATING THEY'LL CONTACT ME WITHIN 7 DAYS VIA POST. I no longer believe that this timeline is a coincidence, no other inference can be drawn at this point except that they are trying to bully me, are prepared to do whatever it takes to put my family on the street even if it is outside of the law and are blatantly thumbing their noses at any due process and/or their own legal obligations. After speaking out in Canberra and actively standing up to their illegal and criminal actions throughout the last 11 years of torture they have inflicted on my family they have stepped up their brazen misconduct. I am the fourth person the banks have tried these tactics on from the list of speakers who attended Canberra over the last 4 weeks. ASIC refused to investigate them in spite of multiple pleas from myself and many other consumers, and the provision of evidence between 2012/2016, ASIC's final correspondence stated they would not be replying to my communication regarding RHG Mortgage Corporation again. This attempt to commence the process for an illegal repossession has severely traumatised my children, I need answers as to how this can be allowed to happen by the very EDR scheme that is supposed to assist my family to resolve these matters with this bank, we need urgent help.